The house stands on what was probably a Norse settlement, later taken over as a grange by Fountains Abbey and is situated at the junction of the old roads from Darnbrook and Arncliffe. The house is recorded as Midlow House as early as the 14th century in monastic documents. In the Poll Tax Rolls of 1379 for Malhamdale you can find Adam de Medlehewe in Malham, and in Otterburn Johannes de Medylhowe, plus others with similar surnames indicating thier origin in Threshfield and Coniston in Wharfedale. In 1480 John Brown was a shepherd here for Fountains Abbey, keeping 275 wethers and 30 hoggs. 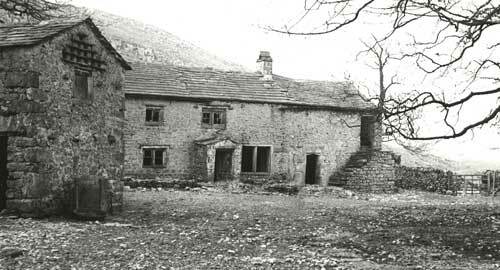 At the Dissolution most of the Malham Moor property was purchased by Sir Richard Gresham and in the course of the next century many properties were sold to their occupants or let on long leases. Thomas Lister of Gisburn Park (later Lord Ribblesdale) purchased the majority of Malham Moor in the eighteenth century and this then passed to the Morrison estate in the 19th century. Thomas Lister had also commissioned a survey of his original holdings in West Malham & Malham Moors in 1760 and another of the Lambert lands he had acquired in Malham Moors and East Malham in 1785/6. Middle House doesn't appear in the detailed schedule for the land owned by Lister in 1760, however there is a full description of it in the 1785 estate survey which covers the land he had recently acquired from the Lamberts of Calton, although no tenant's name is given and it described as "in hand". Penciled notes in the back of the schedule book indicate that the estate was being added to at the time and various plots were being exchanged with other landholders. House, Outhouses, Gardens, Courts, Yards Etc. Coppice taken out of Do. 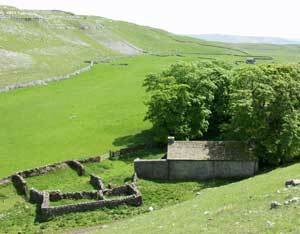 Although ownership may have changed, physical changes to Malham Moor since the end of the monastic period have been relatively small and include some further land enclosure, tree planting/cutting and the general replacement of buildings. 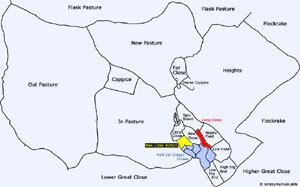 The early estate map clearly shows 18th century Middle House as an isolated, but compact holding, typical of monastic upland vaccaries or stock farms and very reminiscent of Sawley Abbey's similar holding at Stockdale. All the Malham Moor farmsteads dating from the monastic period remained well into the 19th century and Middle House with its fascinating collection of small stock management enclosures has changed very little except for the addition of the new farmhouse and buildings at the head of Great Close. The general opinion is that prior to the 17th century most of the buildings in Malhamdale would have been of single storey cruck built construction, using pairs of curved timbers to create an A frame supporting the roof independently of the walls. These would probably have had low stone walls under a ling or straw thatched roof. These earlier buildings were upgraded or replaced from about 1600 onwards, with buildings of all stone construction, with the dwellings rebuilt mainly as two storey houses, with stone slate roofs. However the picture is probably not as simple as that, as just as we do today,. buildings were often modified and extended to suit the owners requirements and the fashions of the time. Some local buildings show evidence of their alteration from earlier, possibly cruck buildings, with older foundations and large pad stones for the crook beams remaining in the base of the building, gables showing the older steeper pitch required for the thatch where the stonework has been extended leaving a "shadow", and walls showing clear evidence of being raised above the original single storey height. Materials from the old building would be reused and timbers from cruck built buildings are often seen in the roofing timbers of later rebuilds, identifiable by the style of the old, now unused joints they still show. 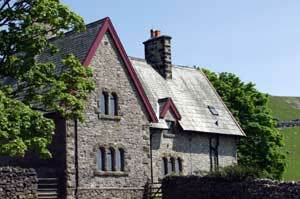 The building was Grade 2 listed in 1989 and has been consolidated and restored since then by the National Trust. It had long been redundant and the census doesn't show anyone living there after John Swinbank in 1881, whose father, William Swinbank was at new Middle House farming the 1500 acres. It was used as additional housing associated with "New" Middle House up to the beginning of the 20th century when it came into agricultural use. for agricultural access. This was recorded by Arthur Raistrick in his 1976 book. Now consisting of three rooms, two from the first phase of building and another added later, the remains of the bay on the right was possibly housing for animals. In the original plan, the door had opened into an unheated room, possibly a byre, indicating a building with a typical hearth-passage plan. The porch was thought by Morkill (repeated by Raistrick) to have been added by Henry King in 1721 (see note below) and the rather crude porch certainly could be 18th century. It formed a new entrance into the living room-kitchen. The narrower inner room was probably divided into an unheated bedroom and larder. The left bay was thought to have been added in the mid-late C18, ,possibly at the same time as the porch and, and has a curved recess which may have been a built-in cupboard. The 1785 estate map shows the building divided in two, with what appear to be individual garden plots in front of them, so this addition could have been made so that it could be split, rather than as an addition to the existing accommodation. 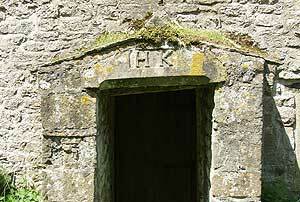 The HK on the lintel at Middle House is unlikely to refer to the Henry King which both John W Morkill and later, Arthur Raistrick surmised in their publications. 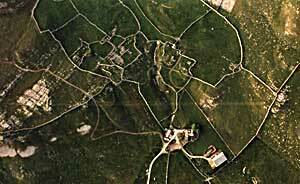 There is no evidence for the King family having connection with Malham Moor or the building. The date of 1721 that they attributed to the building of the porch came from the fact that Henry King (or perhaps that was Knowles too?) had the same initials on a pew in the church of that date, rather scant evidence. Much more likely is that HK was one of the Knowles family who farmed Middle House for many years (see Knowles of Middle House wills). The lintel is not 18th century, more likely 17th century and reused from elsewhere. The 17th century was the period when initials and dates on lintels were popular in the area and this well carved and chamfered, slightly curved lintel sits awkwardly on the crude 18th century porch with its square jambs. Henry's son Martin continued to farm there until his death, and the Knowles wills show the family was still there in 1734. A fine range of 17th century barns stands just to the south of the house, but just as interesting, are the ruins of a 2 bay building, which may well be an earlier house or barn, extending from the north corner of the remaining building. The new Middle House farm buildings were erected a little further south overlooking Great Close, by Walter Morrison in his typical estate style during the second half of the 19th century. View showing the remains of the buildings to the north of Old Middle House. The new Middle House farm built in Walter Morrison's typical "estate style". This can be seen in numerous places around Malhamdale, including The Buck Inn and Kirkby Malham Church Hall, as well as on the estate farms. These details have been edited from the listed building entry, the original version of which is available online at the English Heritage website - Images of England and refer to the survey carried out sometime before the building was restored by the National Trust. In the description, the bays are described as numbering 1-5 from left to right as you view the front of the building, although only the first three remain. Their 4th and 5th bays appear to refer to the building which once had the outside staircase, it only appears to be a single bay in the old photographs, but the east end of the building had collapsed by the time this survey was made in the 1980s. The building as it stood before the collapse of the east end can be seen in the post war photograph by Arthur Raistrick which can be found in his book "Buildings of the Yorkshire Dales". Farmhouse Description Farmhouse, now derelict, built in the mid C17 with probably an early C18 porch and alterations, converted to a farm building in the early 20th Century. Front It has recessed chamfered mullion windows throughout, with 4 and 2 lights to bays 1 and 2 on the ground floor, with the far left mullions missing and the bay 2 mullions hollow-moulded. On the first floor there are three 2-light windows, the central mullion lower and lacking the mullion. Hood moulds are visible on windows to the left of and above porch. To right of the porch there was a blocked window - the left and right jambs remaining in this now ruined wall. A break in the building line to first floor between bays 1 and 2 and traces of a blocked doorway on the far left indicate that bay 1 is additional to bays 2 and 3. There is a banded end chimney stack on the far left. The roof of bays 3, 4 and 5, and the front and east gable walls of bays 4 and 5 have collapsed apart from the blocked original doorway between bays 4 and 5, which has chamfered quoined jambs and a triangular arched head under a square chamfer. Rear At the rear the walling survives to full height. There is a blocked central doorway (opposite the porch entrance) and all other openings also blocked. There is a 2-light recessed chamfered mullion window to the right, and a similar single light above and with another single light to left. There are also the remains of an external staircase and loading door between the rear door and right-hand window, and a straight join between the right bay (1) and rest of the building. Interior In bay 1 there is a gable fireplace with plain stone surround, a shallow curved recess and blocked 2- light window in the partition wall between bays 1 and 2. The standing partition wall between bays 4 and 5 has a stone stack under built in brick. Measured drawings made in 1986 show a large inserted window to right of the porch (?C18) and a 19th Century/20 east entrance to right of the original doorway. The rear stairs and first-floor doorway indicate the conversion of the house to agricultural use in the 19th Century/20, when louvres were inserted into several of the front windows and the cart entrance opened up on the front. Also listed is this associated building standing just a few yards away. 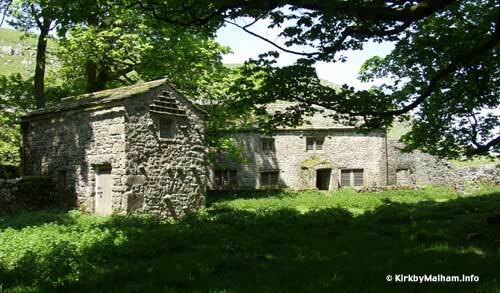 The stable and pigeon loft is probably an early C18 construction reusing C17 remains. Constructed of gritstone rubble with quoins and a graduated stone slate roof it consists of 2 storeys, with a single cell. South wall This has a board door, in quoined surround with large lintel and a square louvred opening to left. East gable On the first floor is a blocked 2-light, recessed chamfered mullion window, the mullion missing. There are 4 tiers of pigeon holes arranged in a pyramid with 1,2,4 and 6 holes, with perching stones to gable. There is a row of through stones at the first-floor level. North front With a square forking hole below the eaves, quoined jambs and random through-stones to this wall. 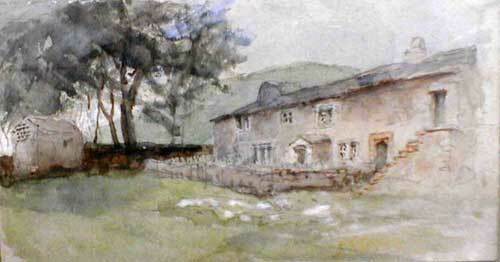 Middle House was still occupied when it was painted by John Ruskin (1819-1900) on one of his visits to Walter Morrison. Aerial photograph Middle House using FlashEarth.com. A user friendly aerial photograph viewer, but it needs a broadband connection.